A chance to meet up with other forum members who live in (or near to) London. We held the first of these Meet Ups last year and it went incredibly well. So well in fact that that a few of us still meet regularly to hang out, drink, eat and play D&D and board games most weekends. 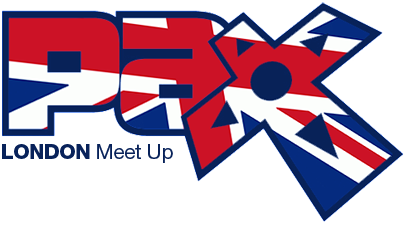 It's obviously a smaller bunch of people that come to this than the US Meet Ups, due to the larger task of making it to PAX from the UK, but it's a great opportunity to meet some friendly faces if it's your first time heading out to PAX and you're not sure what to expect. And if you've been going to PAX for years it's a chance to find a similar atmosphere closer to home. Of course even if you can't make it to PAX this year we'll still welcome you with open arms. Just be ready to have a lovely evening of us all making you insanely jealous of the great times you won't be having. Where are we going? And does it have cool things like Pinball and Pool? We're all meeting at the Pipeline Bar, near Liverpool Street, Aldgate and Aldgate East Tube stations. It's a bar that does food and drinks, and has cool things like Pinball and Pool. I'm intrigued, can I have the details? 6.00pm until we all get bored of each other's company. I would totally be there but I'm stretching my budget going to Seattle as it is. Pour one out for me. What would PAX be without a good pre-PAX meetup in central London? As the OP says; you don't have to be going to PAX to come along, I mean this bar does have pinball tables! I want to eat food and play games!